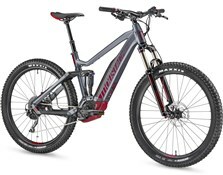 Experience the smile-inspiring power to ride more trails. The Specialized Turbo Levo FSR Comp Carbon 6Fattie is an electric mountain bike that will enable you to ride further, explore more, and increase the fun factor. The FACT 11m carbon frame is significantly stiffer than the alloy models, so you get more control and accuracy when the going gets tough. 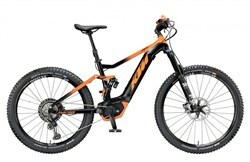 You also get a 450-gram weight saving to give the motor less work on the climbs. Delivering 15% more power for 2018, the Turbo 1.3 electric bike motor now boosts your natural pedalling power with increased efficiency. The RX trail tune offers optimum off-road electric bike performance, and the power assist is completely intuitive. Pedal engagement is instant, and torque is consistent throughout your entire cadence range, so it is very easy to adapt to the extra power that the motor offers. The smiles will keep on coming as you can ride further and faster with less effort. Three power modes are easily selected, either on the battery itself or with the Trail Remote on the handlebars, so you can choose how much power assist you want the bike to deliver. The 504Wh eBike battery pack is housed neatly in the down tube. As well as offering the cleanest lines of any electric mountain bike, this clever design also means that the centre of gravity is very low. 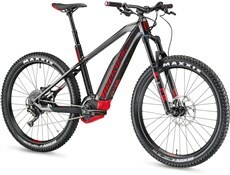 This makes the Turbo Levo incredibly stable on the trails, boosting confidence as well as pedalling power. The battery can be charged either on or off the bike in about 3 hours. ANT+ and Bluetooth connectivity allow you to connect to a variety of devices including Garmin cycle computers. Offering a range of innovative features, the Specialized Mission Control smart phone app really sets the Turbo Levo apart. You can customize the motor response, as well as the power modes, so the bike works for you in just the way you want it to. With Smart Control, the Turbo Levo can manage the motor output and battery capacity itself, tailored to the distance or time of your ride. You can also set the remaining capacity that you want to have left in the battery at the end of your ride, so you have enough juice left to ride the next day as well. 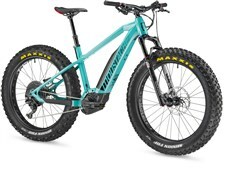 With all that extra power, the additional grip and float, offered by the 2.8” Butcher tyres on the 6Fattie (27.5”+) wheels, is just what you need to make the most of the trail. 38mm wide Roval Traverse rims offer the ideal support for the big rubber, allowing you to make the most of the extra volume by running lower pressures to make the tyres conform to the trail for a smoother ride. Front travel has been increased for 2018, and the capable RockShox Revelation RC fork now offers 150mm of bump soaking suspension to complement the 135mm offered by the Monarch RT on the rear. The SRAM GX 1x11 speed drivetrain delivers reliable shifting with a wide range of gears for taking on all the climbs – with less effort of course. 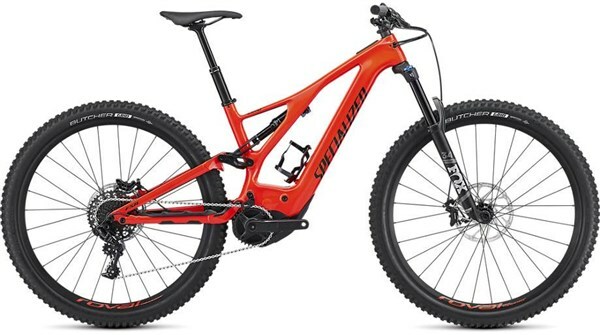 SRAM Guide RE hydraulic disc brakes are specifically designed for eBikes, and offer significantly more power than the regular guide brakes, thanks to the oversized Code calliper. Just what you need when eBiking on challenging terrain. 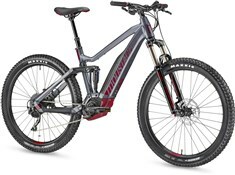 Offering the perfect blend of trail performance and power, the Specialized Turbo Levo FSR Comp Carbon 6Fattie delivers the ride of your life. Front Tyre: Butcher, GRID casing, 2Bliss Ready, 650b x 2.8"
Rear Tyre: Butcher, GRID casing, 2Bliss Ready, 650b x 2.8"